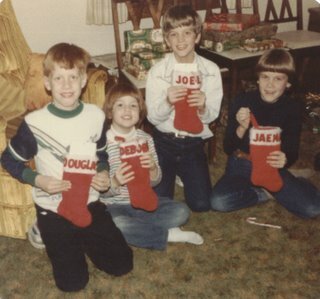 While at Grandpa and Grandma Bowman's house, we hadn't searched for our special red stocking that had our name on the top in red felt letters - and the stocking always had a silver dollar in it. Grandma Porter hadn't read the Christmas story on Christmas Eve. Dad or Mom didn't surprise either each other or one of us kids with "one last present." You know the kind, everyone has opened up all the presents, we begin to clean up the paper, and then one of them would say, "Wait a minute...we aren't quite through yet." Grandma Bowman hadn't called by 10:00 a.m. Christmas morning, wondering if we were through opening up presents so they could come out for Christmas dinner. Cookies, milk, and a carrot hadn't been left out for Santa and Rudolph. Dad and Mom's presents to each other didn't have sappy tags such as "To Hubby From Wifey" or "To Mrs. Coach From Mr. Coach." My brother hadn't counted all of his presents on Christmas morning to make sure they were equal in number to mine. Joel, Jaena, Doug, and I hadn't been sat at the "kid's table," a card (I mean folding) table set up in our living room for Christmas dinner. We hadn't taken a "cousin" picture on Christmas eve. My brother and I hadn't hung the soldiers on the Christmas tree, and my brother hadn't hung his little marshmallow man that he made in kindergarten front and center. Hugs, kisses, thanks, and love hadn't been the theme throughout the season. We didn't spend Christmas eve with my parents. We didn't spend Christmas day with Jason's parents. If Elizabeth didn't bake a birthday cake for Jesus to take to Grandma and Grandpa Wuertley's house Christmas day. If we still didn't search for our stockings at Grandpa Bowman's house - and now the kids have their own stockings with the felt letters. Yes, he still puts a silver dollar in each one. 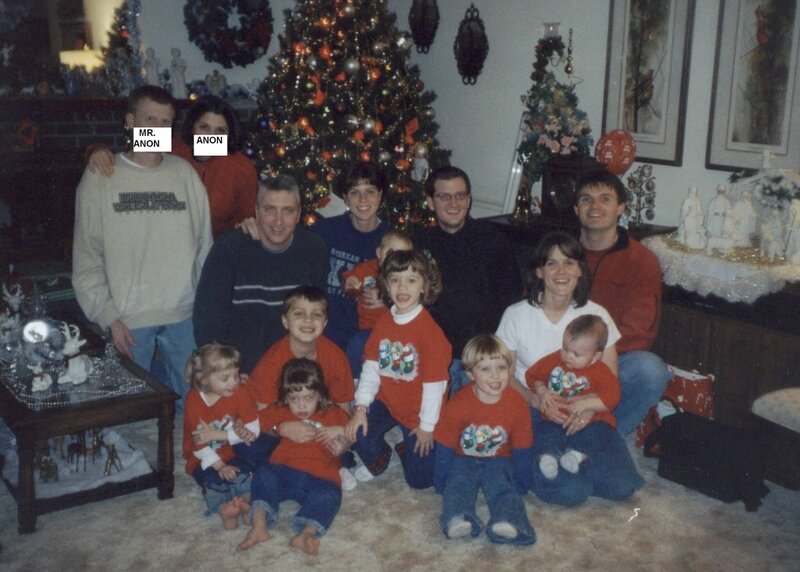 If we didn't take a cousins picture at Grandpa Bowman's house. If Elizabeth and Anna didn't hang up "their" ornaments. If Elizabeth and Anna didn't leave cookies, carrots, and milk for Santa and Rudolph. If Mom's stockings for us didn't come in a grocery bag. If I didn't listen to the Carpenters "A Christmas Portrait" a hundred times or more. If Mom didn't call by 10:00 a.m. to wish us a Merry Christmas. If the talking lips didn't make an appearance. If hugs, kisses, thanks, and love weren't the theme of Christmas. It's interesting as the years have passed how some traditions have stayed the same, and some new traditions have been established as a result of the additions of family. There are schedules to juggle and parties to plan and programs to attend. Over the last few years as Elizabeth has gotten old enough to understand all about Christmas, I really struggled about things such as Do we let her believe in Santa? How many presents should we give? We could do three to be symbolic, we certainly don't want to spoil her. If we give her toys, and grandparents give toys, and aunts and uncles give toys, we won't have room for them all. Will she understand the true meaning of Christmas or will it be all about the presents? And then whatever we decide for Elizabeth, will we hold true to that for Anna? And then this year I've realized that while those questions matter, I am not going to stress about any of it. I grew up with a mom (love you mom) who loved to give us lots of presents, and I thought that was great (I still do.) Yet even with the nice presents and stockings, as a child I never lost sight of the true meaning of Christmas. I believed in Santa for a little while at least, yet I still believed in the Christ child. Christmas is the birth of Jesus! That's the most important thing. That is what we are celebrating. The other "stuff" is just bonus. I think in the midst of all the other "stuff," my kids get that, just like I did. Each family carves out its own traditions and way of doing things, and I think that is important. 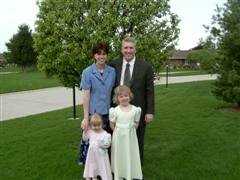 I treasure the traditions that I grew up with, and I treasure the ones we have started now with our family. And along with the parties, the programs, the family get togethers, and the food, my favorite part of Christmas is that the hugs, kisses, thanks, love, and the realization of the importance of family abound at this time like no other. 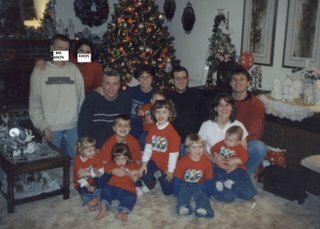 I was busy editing while you were posting - I couldn't get the pictures on earlier, and I finally had success with the "then" and "now" when I figured I should delete the "now." Then after that, I had trouble getting the "then" picture on again, but I perservered. Notice how punctual I am at commenting on your comment. I've perservered once again, and with the help of my computer savvy husband, I was able to post a "now" picture. Look how cute Maria and Elizabeth are, oh my goodness. LOL I love the now picture! "Then" was pretty cute, too, but I didn't have to blow it up on my screen to figure out what those little white boxes were. I saw this post last night before the pix - - - - now I find the pix and I LOVE them. Afraid I was a little dense about the cards up in front of the faces until I read the comments. Too funny. Actually, Anon, Anna was trying to be just like her aunt. She's hiding behind your oldest daughter's head. Okay, I'm seriously gonna seem like a copycat, but I'm planning to do a similar post. It will be different obviously, but same idea. Although, there were many similarities. Sounds like our mom's could be sisters. I don't mean to keep talking about Maria, but look at that little stinker cracking herself up. She's so ornery. I think she's instigating something there with her baby sister. Can you see the expression that I'm talking about? She still gets that "little comedian" look on when she's stirring up trouble. I am often questioned about our families Christmas traditions. I am asked why we always go to my parents for the days just before and after. Don't we want "our own" Christmas at home? I have never thought of waking up at my parents on Christmas morning as anything but our own-I have been waking up at my parents on Christmas for 35 years now. It is my christmas. Tradition is very important to me and thankfully God gave me a spouse who gets along very well with my family and have never asked for any other Christmas than mine. We are away from family so much of the time that spending that time with my parents is very special. I love sharing the joy of watching Jake open his gifts with his grandparents! By the way-is it Christmas yet??? Kel and I are testing something.